For this month’s Get Mixed session, I picked a track by Montrealer, Mr. Ju. I liked the electronic distorted reality type of vibe. The track had a perfect mix of electronica, dramatic sound effects and sweet melodic touches that were underlined by big distorted drums and a pulsating dubstup synth line. I started the session by going throughout the tracks and routing the channel outputs to my aux groups ( drums, bass, melody and space) which eventually go to my 2Bus. . 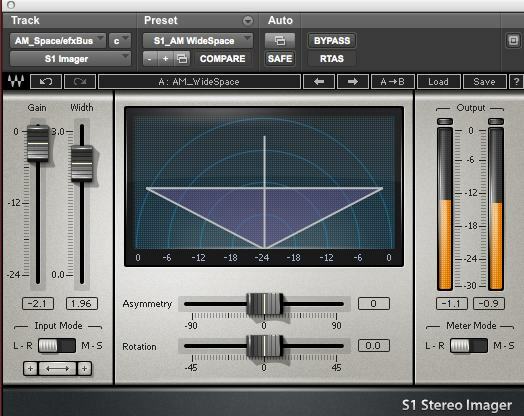 I split most of the stereo tracks into mono to have more control in placing the sounds into the stereo spectrum. I prefer that since I like to have different processing on each channel although they are the same instruments, I usually blend in different tones and colours. For this mix I will focus my mix notes on the effects and drum bus. Mainly because the song was laced with spacey effects, blasts and washes. I will list some details on the space/effect bus first, In order to give the mix a wider image and also make space for the massive drums and create room for the dubby low end. I kept my panning wide, I used the Waves S1 Stereo Imager to further exaggerate my stereo spread. 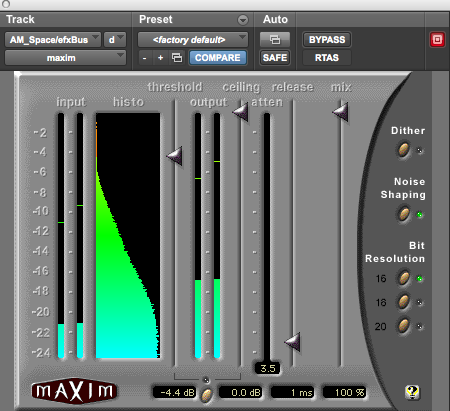 After the Waves S1, I used the Digidesign Maxim plug-in which is a powerful limiter that has control over the hysteresis, which I find sometime gives me more flexibility when I want to boost the overall level on the high frequency material. I picked that over the L2 since I am using it to give the sound effects that high definition without crushing or chattering the top end, the result gets me closer to that THX sound. 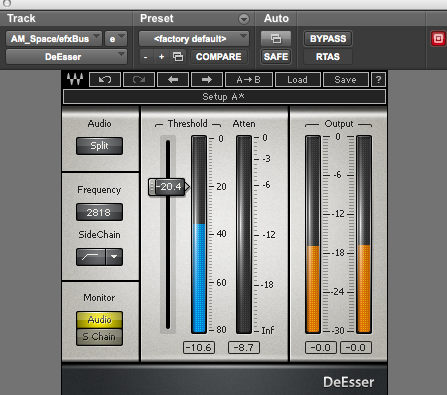 I found that some of the effect sweeps had a little to much sibilance specially after I pushed the levels through the Maxim, so I controlled that with the Waves DeEsser, which I set to tame the frequencies above 2500hz. 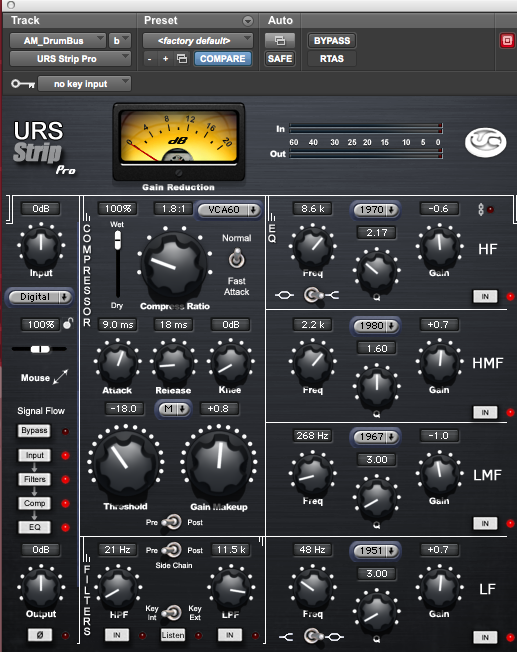 On the drum bus I used the URS Strip Pro, I used very light compression with a fast release, just enough to glue both drum parts since they had different processing and Eq on their respective channels. I boosted the bottom and the mid range with a narrow Q to give the drums a round bottom and more snap. I also rolled off some mud at 286Hz for more definition. I hope some of this info was useful. Next time I’ll cover other mixing techniques I use. In the mean time send me those roughs and if you have any notes, comments or tricks please get back at me.